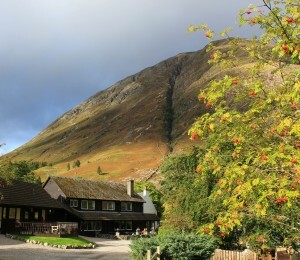 Special Offers to coincide with our own little festival celebrating autumn in Glencoe. Clachaig’s Octoberfest started off life nearly 20 years ago as a Beer Festival, allowing us to showcase some great beers at a time when cask conditioned ale in Scotland, and particularly in the Highlands was much harder hard to come by. Over the years, the festival has evolved and now is a celebration of one of the best times of year in the Highland glens. Enjoy the spectacular autumn colours, breathe in the fresh air and enjoy the atmosphere of a Highland autumn. Enjoy bracing walks by the lochs and through the glens, then return to the fireside at Clachaig for some great food and drink, and a warming dram by the log fire in the Boots Bar. What’s included in the Octoberfest special offers? A healthy discount on our usual tariff. The longer you stay, the more you save! A full cooked Scottish breakfast featuring a variety of locally sourced products. DB&B options offer even better value and include a free choice of 3 courses from our usual menu plus tea or coffee, offering excellent value for money. Rates are for a twin / double room with en suite facilities and include a full Scottish breakfast, and do not apply to single occupancy. These special offer rates are not available via the online booking engine. Please contact us directly by and quote “Octoberfest Special Offers” along with your preferences for dates and room types. From Award Winning Clachaig Inn, Glencoe. There is no service charge. Gratuities are optional. All bookings must be confirmed with a deposit. Please indicate at the time of booking if you require a confirmation of receipt of your deposit. Residents who are arriving late are requested to give notice. The full cost of the first night bed and breakfast cost is required to secure a booking. Please note deposits are non-refundable. Payment may be made by credit/debit card using our secure payment form. Please check availability first. Rooms are generally available for check in by 4pm. Please let us know if you are likely to arrive earlier. Guests are requested to vacate their bedrooms by 10.30 am on the day of departure. The Hotel’s doors are closed at midnight. Dogs are only permitted in a very limited number of hotel bedrooms. There is a strict limit of one dog per bedroom and only by prior arrangement. Dogs are charged £10.00 per night. Please see Dog Policy for conditions. Scottish law dictates that smoking is strictly prohibited in any enclosed public area, such as our bars and communal areas. All our bedrooms are non-smoking and non-vaping. Furthermore, you must not tamper with our fire detection system. If you do, we reserve the right to terminate your booking without refund and charge you any costs we incur if you smoke or cause damage in our Inn including costs for specialist cleaning (to make the room fit for sale as a non-smoking environment) and the cost of the room for any period it is unusable. Vaping is not permitted anywhere in the Inn.